To see upcoming class start dates or to register for a class, please use our online registration system. Audit a Class: Some people learn better by watching rather than trying to listen and work their dog at the same time. Auditing allows you to watch the class and then take what you learn home and apply it to your training. To audit a class, please create an account in our registration system, then send an email to info@animalalliances.com letting us know which class you'd like to audit. Do you have a new puppy and want to get started on the right foot? 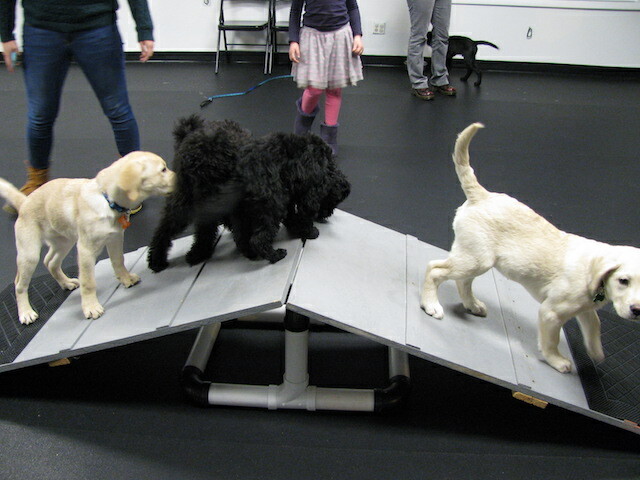 This class is for puppies 8-16 weeks old. This is the perfect time to start teaching your puppy the basics so they can become well-mannered family members. We will start teaching the puppies some behaviors (sit, lie down, coming when called, leave it) and also give them a variety of socialization experiences. Owners also learn about housetraining, puppy nipping and teaching good bite inhibition, and the importance of socialization. The whole family is invited to attend, including children. Age: Pups must be between 8 and 16 weeks old on the first week of class. Length: 5 weeks, 1 hour per week. First week is orientation for humans only. This class focuses on improving your relationship with your dog through effective communication. You will learn why dogs do what they do and how best to train them. Your dog will learn the important basic skills that will help him/her to be a well-behaved member of the family. The whole family is encouraged to attend, including children over 6 years of age. Does your dog know his/her basic manners at home and in the classroom, but have trouble applying them to "real life"? Would you like to teach your dog to do super stays, walk nicely on leash past big distractions, come when called even when they're being tempted not to, and leave food dropped on the floor alone? Intermediate Manners will help you and your dog move to the next level with your training. Prerequisites: Dogs should be able to do basic loose-leash walking in a classroom or equivalent moderate-distraction environment, stay while their handler walks 5 steps away and back to them, come 10' when called in a classroom or equivalent environment. Length: 5 weeks, 1 hour per week. Dogs attend all 5 weeks. This class takes distraction to the next level. The dogs will learn to work in close proximity to each other, come away from enticing distractions, walk past food, dogs, humans and other temptations, go lie down on their mats, and wait politely at doors. Prerequisites: Dog should be able to do good loose-leash walking past stationary distractions; stay while handler walks 5 steps away and drops a toy or treat on the ground; come past distractions on the floor; ignore a treat placed or dropped on the floor. Canine Good Citizen is the American Kennel Club's certification for dogs who pass a test of their good basic manners, including sit, down, stay, come, good leash walking, ability to stay calm around new humans, ability to accept petting and handling from a new human, and ability to be left with a new human for 3 minutes while their handler is out of sight. For details on the test please visit the AKC website. Prerequisites: Intermediate Manners or equivalent. Length: 5 weeks, 1 hour per week. Dogs come to all 5 classes. The CGC test will be administered the final week of class. This is an outdoor class held at Childs Park in Northampton. During the class, your dog will work on all the basic commands (sit, down, stay, and come) in the distracting environment of the outdoor world. We will also work on polite greetings of people and dogs, walking on a loose leash. and leave it (coming away from things on the ground you don't want your dog to pick up). Length: 4 weeks, 1 hour per week. Dogs come to all 4 sessions. Has your dog mastered the skills in Outdoor Etiquette Level 1? This class will continue to improve your dog's skills at leash walking, leave it, and coming when called and add in some new behaviors that are useful when taking your dog out in the world. Prerequisites: Outdoor Etiquette Level 1. Does your dog bare her teeth, growl, bark, snap, or lunge when she sees other dogs or humans? Or does she hide behind you or cower? This class is for dogs who are "reactive", or have an inappropriate reaction to dogs, people, cars, bicycles, or other things in the world. We will work on skills for helping your dog look at their triggers calmly, check in with (look at) you automatically when they see their triggers, and walk past their triggers without reacting. We'll gradually work on getting closer to other dogs as each dog is ready. We'll also practice strategies for keeping your dog under threshold when you encounter another dog. Length: 5 weeks, 1 hour per week. First week is Orientation for humans only - no dogs, please! Have you taken Remedial Social Skills I and want a way to keep practicing your dog's new-found skills at looking at other dogs (or humans) calmly? The best way to do that is through practice setups, where the dog's triggers are at a controlled distance and intensity level to prevent them from going over threshold and to build their confidence and trust that they are safe. Since it's often hard to find opportunities to practice, we offer Remedial Social Skills II. In this class, we will do lots of setups, increasing the challenge as your dog is ready. Student dogs will practice looking at triggers, automatically checking in with their humans when they see triggers, performing known behaviors (touch, sit, down, etc) near their triggers, walking while their trigger is in sight, and walking away from triggers. Length: 4 weeks, 1 hour per week. Dogs attend all 4 weeks. It is crucial for dogs to practice their social skills with other dogs, especially in the first 1-2 years of their life, but it's difficult to find opportunities for your dog to interact with others off leash in a safe setting. Dog Social Hour is the answer! Dog Social Hours are social skills practice sessions for dog-friendly and human-friendly dogs 5 months and older who have taken at least 1 class at Animal Alliances. 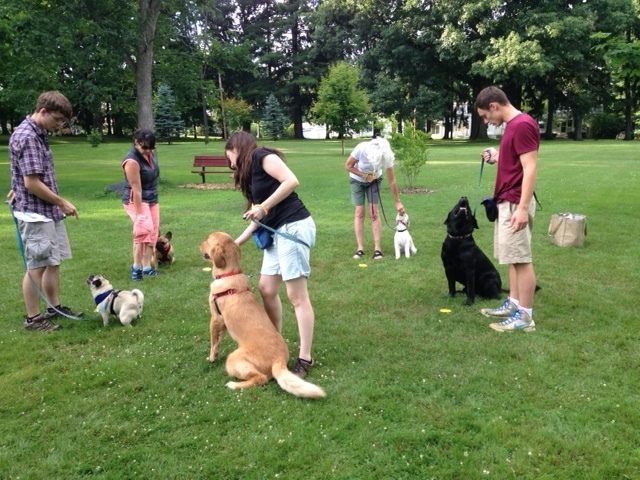 At the start of each session, we will help the dogs calm down and regain their focus. Next we will introduce them to each other one on one, helping them remain calm and polite. After that, we will let the dogs interact off-leash. Dogs who want to play can play (although we will help them learn to ask politely and to read other dogs' social cues in response), and dogs who want to just hang out and watch can do so. Just being around other dogs and observing will help your dog build social skills and confidence around other dogs. We will make sure the dogs take breaks from play to keep them from getting over-aroused. Humans are encouraged to ask questions about dog play and body language! Prerequisite: At least one Manners class at Animal Alliances. Length: 4 weeks, 1 hour per week. 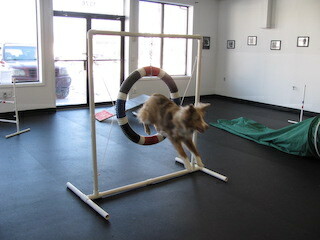 Agility is a fun sport that provides your dog with mental and physical exercise. It also improves relationships because Agility is all about teamwork. This class will get your dog started with this fun sport. There is no pre-requisite for the Beginner Agility class. Kids over 12 years are welcome to join and work their dog in class. Length: 4 weeks, 1 hour per week. Dogs attend all 4 classes. While sit, down, stay and come are very important behaviors for your dog to learn, it's fun to teach them some tricks too. The tricks your dog will learn in this class include - jump through a hoop, spin, roll over, play dead, bow and a few more. This class is fun for dogs and their humans. The class meets once each week for an hour for 4 consecutive weeks starting on the dates listed below. The dogs come to all 4 classes. There is no pre-requisite for the Tricks class although a Basic class under your belt can be helpful. Prerequisites: Basic Doggie Decorum or equivalent. Nosework is a class that encourages your dog to use their #1 sense - their sense of smell. 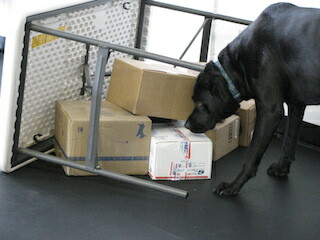 Your dog will learn to seek and find hidden treats in a fun and enriching way. Have you taken Manners classes with your dog and are now looking for a way to push your skills to the next level and build your human/dog teamwork? Rally Obedience is a fun dog sport in which dog and handler teams complete a series of activities together. These activities range from walking together while weaving through cones to having your dog stay while walking around them to walking quickly and slowly and having your dog match your pace. This class will introduce you to all of the skills needed for Novice Rally-O and then let you and your dog try out some Rally courses to use those skills. Rally-O is a fun way to use all the behaviors you've been working on in Manners classes to increase your bond with your dog! This is also excellent preparation for the Canine Good Citizen test, for becoming a Therapy Dog, and for increasing your dog's attention and leash walking and obedience skills for real life. Prerequisites: Teams should have strong skills in Intermediate Manners: very good basic leash walking skills (dogs should be able to keep leashes loose and pay attention to where their handlers are going when walking), and be able to hold stays while handlers walk away and return. Length: 5 weeks, 1 hour per week. Dogs attend all 5 classes. Prerequisites: Dogs must be at least 8 months old and in training to assist a disabled handler. Dogs must have completed at least two manners classes (e.g., Basic Doggie Decorum and Intermediate Manners or equivalent) OR one basic manners class and private training with a trainer with compatible methods. Length: 6 weeks, 1 hour per week. Dogs come to all 6 sessions. Would you and your dog love visiting and bringing comfort to others? Become a Therapy Dog team! 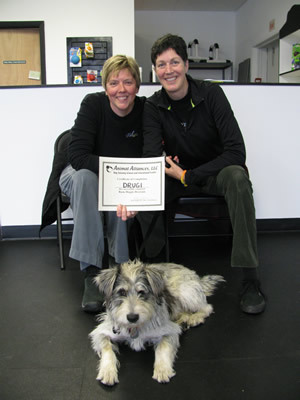 Local therapy dog organization Bright Spot conducts regular therapy dog training workshops at Animal Alliances. Each workshop meets twice on Sunday mornings for 2 hours. To see upcoming workshop dates, register for a workshop, or find out more about therapy dog training, visit the Bright Spot website: http://www.bright-spot.org or email Bright Spot at info@bright-spot.org. Length: 2 sessions of 2 hours each on Sunday mornings. Dogs come to both sessions.